-I am grateful to the church archivist for this information. I aim to add more in time. Historical notes: A fascinating handwritten sheet survives in the church archives, with a date of 22nd May 1843 on the bottom, and you can see a copy by clicking here - but it is a big page and may take time to load. I have in any case summarised the contents on this page. Quotations below come from that document unless otherwise stated. George Whitfield, in his diary, mentioned progress in Canterbury, noting on Nov 30, 1750 that "There is a sweet work begun and carrying on at Canterbury". He later noted (13/1/1751) that "Satan has done at Canterbury as he always does elsewhere. He has overshot his mark". Clearly, their numbers swelled, for they built a chapel. 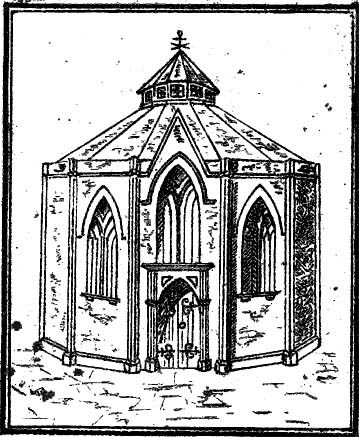 This picture shows the original chapel "sometimes called ROUND HOUSE CHAPEL", and "sometimes called PEPPER-BOX CHAPEL" erected by the Wesleyan Methodists in 1764 in King Street "with materials purchased on the taking down St. Andrew's Church [sic]" and "on a site of ground which for ages had formed part of the Cemetery belonging to the Monastery of the Black Friars"
To see the exact site of this chapel, see the 1822 map, which still shows the old chapel and not the new one. In the 1843 manuscript, we read about the Pepper-Box Chapel, that "on Monday August 20th  it was opened for Divine Worship by the REV.JOHN WESLEY who addressed a crowded audience from LUKE X. 42 'ONE THING IS NEEDFUL'. It is worthy to record that the venerable man continued his visits at intervals, till nearly the termination of his distinguished career, which occurred - March 2nd 1791. The Wesleyans having worshipped here 47 years, and greatly increased in number, left Jan. 1-1812 for their present commodious chapel." In fact, Wesley's diary of that date, 20/8/1764, records this visit. He apparently visited the Canterbury area 40 times between 1750-1790. He usually travelled from London on the Dover Road and made Canterbury the centre for his visits to the East Kent Methodist Societies. 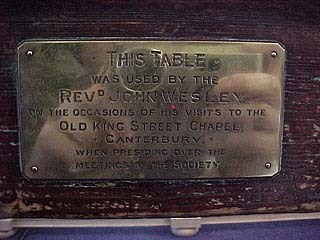 The church still possesses the table he used on his visits - see photos below. 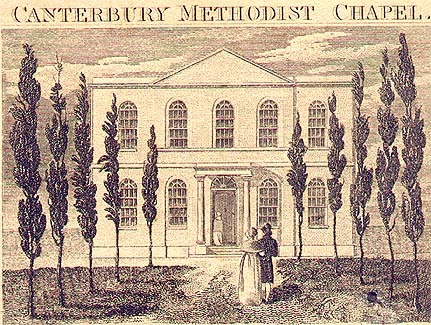 A note in the church archives notes that "Early Methodist were inclined to be austere and lacked financial backing but the Canterbury Society prided itself on its lively church orchestra and singers"
Picture of the Chapel in the early 1800's. The line of Poplar trees was felled in 1828 and a graveyard laid out at the front of the Chapel. See more about the building below. After extensive alterations & repairs involving a total of £1.300. 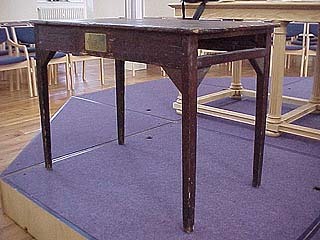 it was again solemnly appropriated to the worship of JEHOVAH 22nd May 1823. On that memorable and interesting occasion the Rev. 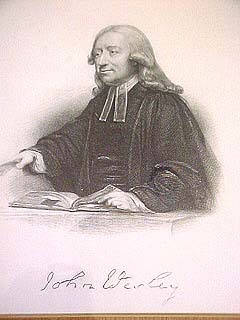 J. Uppadine of Hammersmith, the Rev. W. Giles of Chatham, & the Rev. J. Griffin of London preached. The Sabbath School was established 1st April 1824. & the church formed by the Rev, W. Giles of Eythorne in 1825. In 1838 one of the cottages was converted into a vestry, & the minister's vestry added in the following year. "Here Lord display thy saving powers, while temples stand and men adore" 22nd May 1843 [which I take to be the age of the manuscript, as it ends here.]. 1643 - John Barton buys a property bounded by St. Peter's Street and the Grey Friars from John Mannakee. Three buildings fronted St. Peter's Street, one of which the family lived in and the other [sic] let to tenants. After ownership by the Gostling family it was bought by William Cheavale who was a Wool Stapler and had a large Warehouse at the rear of the residence. 1809 - the Church Trustees decided to buy the property from his son, John. Joseph Hagell, whose brother owned the neighbouring baker's at 50 St. Peter's Street, was the negotiator for the church. 7th May 1811 - After a 'disastrous fire' the site was eventually cleared and the stone laying carried out. 31 Dec 1811 - LICENSING: The Canterbury Cathedral archives have a manuscript (reference appears to be: DEb/H/A/173) which is a letter from church members asking permission from the Archbishop of Canterbury to register the new Chapel under the Toleration Act. This licensing was obligatory. 1st January 1812 - The very next day, the new Chapel was opened, the congregation moving from the Chapel at King Street. The total cost was £8000, 'an enormous sum which crippled the Trustees for many years, and it was not until 1880 that the debt was finally cleared'. 1828 - Poplar trees (see picture) were felled and a graveyard laid out at the front of the Chapel. 1851 - Attendances for the Chapel were over 1,000 on a Sunday during three services. 1903 - Gravestones were moved back against the wall.